Born and raised in Vermont, H. H. Bennett moved to Kilbourn City, Wisconsin, in 1857 to make a new life for himself and his family in the rapidly developing Midwest. He originally worked as a carpenter, but an injury during his service in the Civil War forced him to find an alternative career after hostilities ceased. 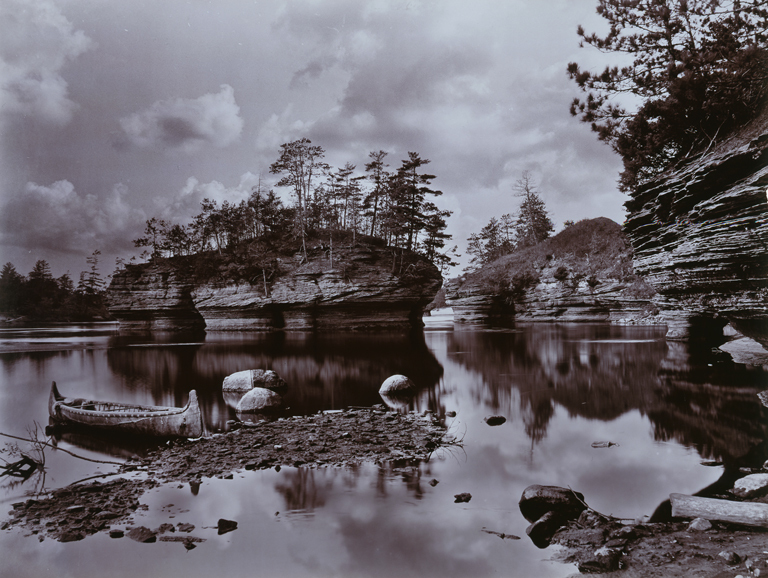 He bought a photography studio and stereographic equipment in 1865 and, by the 1870s, had a lively business producing single views and stereographic cards for the burgeoning Wisconsin Dells tourist trade. This photograph amply demonstrates his skill in composing scenes that emphasize nature's imposing majesty while advertising the terrain's availability for traversal by visitors, suggested here by the picturesquely placed canoe. Rath, Sara. H.H. Bennett, Photographer: His American Landscape. Madison, Wisconsin: Terrace Books, 2010, b/w p.198. Andera, Margaret, Nonie Gadsden, Britt Salvesen, and Laurie Winters. Collection Guide: Milwaukee Art Museum. Milwaukee, Wisconsin: Milwaukee Art Museum, 2004, pp. 58 and 73, cat. 98, color illus. p. 58. Milwaukee Art Museum. Building a Masterpiece: Milwaukee Art Museum. New York: Hudson Hill Press, 2001, p. 205, color illus. p. 205, color details p. 202, 203.